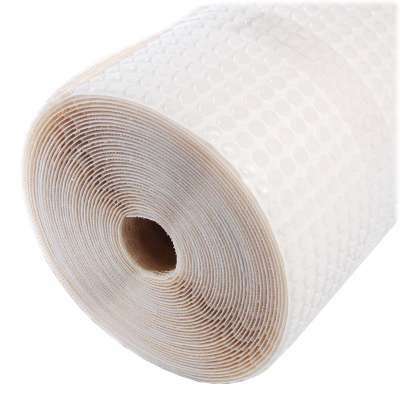 PermaSEAL 3 Mesh is a high quality meshed membrane suitable for use as a damp proofing membrane above the ground internally. It can also be used as a waterproofing membrane below the ground as part of the PermaSEAL Waterproofing System. Having a 3mm stud means that PermaSEAL 3 Mesh only has an overall thickness of 3.5mm and is therefore the preferred meshed membrane where space is of a premium. PermaSEAL 3 Mesh has a high quality meshed surface which provides an excellent ‘key’ for lime mortars, renders, plasters or dabbed plasterboard. Please see the PermaSEAL Mesh installation instructions for details of fixing and finishing of the product. PermaSEAL 3 Mesh is guaranteed against deterioration for 30 years and has a life expectancy of at least 50 years (DIN 9001:2000). It is an inert product with high compressive loading stability. It is highly resistant to water, alkalis, saline solutions and organic acids and is not affected by minerals. It is also resistant to bacteria, fungi and other small organisms.